Recently we had to implement custom key store provider for always encrypted. 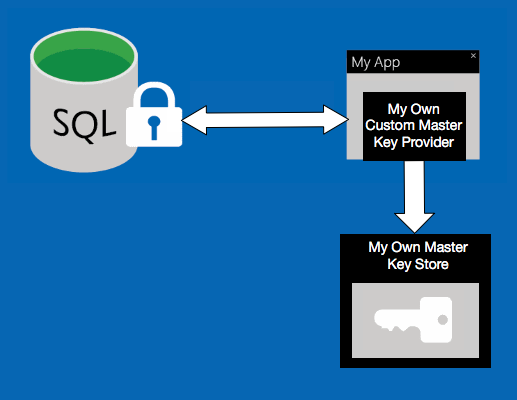 We wanted it to access our own key store to retrieve the master key and to decrypt the column key. It was not very clear how this can be achieved. So I've decided to produce a PoC and write an article about it. Make sure your project is set to .NET Framework 4.6. Incorrect parameter encryption metadata was received from the client. The error occurred during the invocation of the batch and therefore the client can refresh the parameter encryption metadata by calling sp_describe_parameter_encryption and retry. //Apparently this works transparently with the Hibernate and the Entity Framework! How to register "MY_OWN_CUSTOM_KEY_STORE_PROVIDER" in SQL Server 2016 ? So that I can create keys from SSME and select "MY_OWN_CUSTOM_KEY_STORE_PROVIDER" as provider. Can you please refine your question, I am not sure what you are asking. in my case I want to encrypt the exiting table data. "TaskUpdates: Message:Task: 'Performing encryption operations' -- Status: 'Failed' -- Details: 'Task failed due to following error: Failed to decrypt a column encryption key. Invalid key store provider name: 'Vormetric Key Storage Provider'. A key store provider name must denote either a system key store provider or a registered custom key store provider. Valid system key store provider names are: 'MSSQL_CERTIFICATE_STORE', 'MSSQL_CNG_STORE', 'MSSQL_CSP_PROVIDER'. Valid (currently registered) custom key store provider names are: 'AZURE_KEY_VAULT'. Please verify key store provider information in column master key definitions in the database, and verify all custom key store providers used in your application are registered properly.'" I guess this is because still my custom provider is not physically registered with SSMS yet. I don't think this is possible when you use custom key store option. Remember that only your application can actually decrypt the master key. If you are trying to do this in SSMS it will fail as it does not have the master key. I think that your only option here is to create a new encrypted column and migrate data over into it. Hi I have been following this article and am stuck on Database Step 2. You state: Encrypted value needs to be some random value that gets encrypted by your master key but how/where do I generate that and how long should it be? Once I have the master key do I pass it through the EncryptColumnEncryptionKey function to get the Encrypted value?